Each buyer has left positive feedback (I want a gift) - gets one of more than 40 different games for Steam. Which one? You will learn about this when you receive your GIFT. 2) Leave a positive review with the comment "I want a gift"
Subscribe to a gift done within 48 hours after writing a comment. Attention!! By putting a review - you guarantee that you have read all the conditions for a Gift and if something is not clear - they asked. For a positive review on this product, I will give the buyer a gift certificate in the amount of 5 rubles. Each buyer will also receive a promo code, he gives an excellent discount on all our pre-orders! 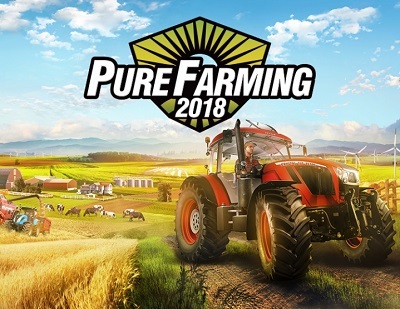 Experience the life of a true farmer in all its glory with Pure Farming 2018: Digital Deluxe Edition! Discover a new territory in Germany with unique opportunities - growing rapeseed and sheep; Get access to three specialized cars and 4 special costumes. Farming is again in trend: it's time to go global! Put the latest technology and modern licensed machines at the service of agriculture! Travel around Europe, Asia and America and take care of the plants typical of these regions, be it hemp, coffee or olives. Explore all aspects of farming in three unique game modes, suitable for both experienced simulator players and beginners. - Licensed equipment - use machines from industry leaders: Zetor, Landini, McCormick, Gregoire, DAF and Mitsubishi, recreated in full compliance with the originals, including the mass and mechanics of the work. Immerse yourself with them in the atmosphere of managing a modern farm! - Global scale - travel to farms in Italy, Colombia, Japan and the US state of Montana. Grow unique plants for these regions and use original specialized equipment - a rice planter, a hemp harvester and others. - Farming for all - three game modes for different styles of play. Enjoy your own farm without limits, learn the basics of agriculture or test your own skills as a farmer!